Electric motor-driven equipment such as pumps, blowers, compressors, and process machinery typically accounts for the majority of an industrial operation's energy usage. Easily deployed data loggers that track motor on/off time are a low-cost means of identfying areas for reducing unnecessary motor runtime. 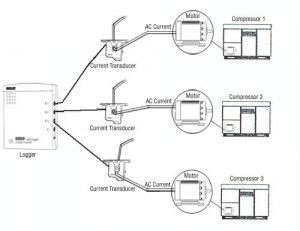 The example depicts 1 logger measuring 3 different motors simultaneously.